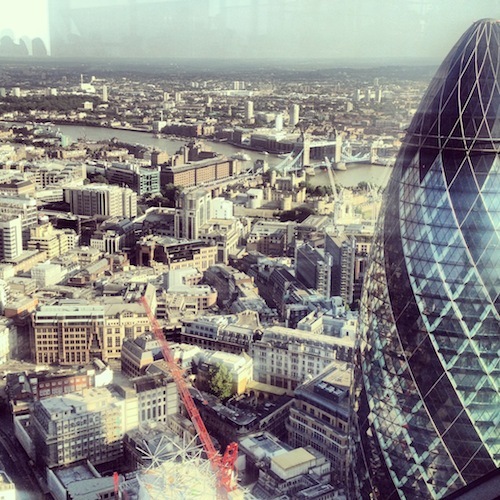 Two quick pics for you here: the first was the view from my table at the Duck & Waffle, the second is a photograph of my dinner that I had at the Duck & Waffle a few weeks ago which was, as you may have guessed by now, a Duck & Waffle. Crispy-skinned confit of duck on a fluffy, perfect waffle (made of pancake batter, for those in the UK who are thinking of potato waffles) topped with a huge fried duck egg and served with maple syrup. 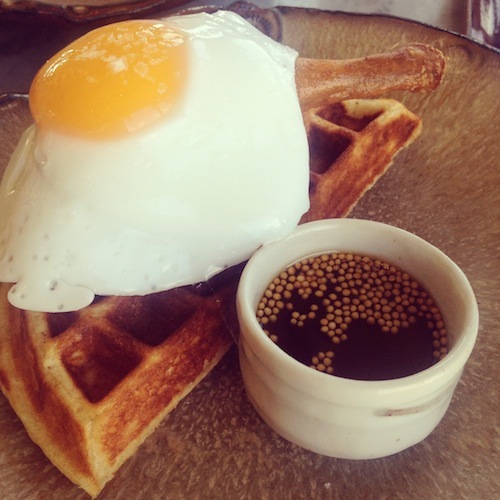 The Duck & Waffle is on the fortieth floor of Heron Tower, just next to Liverpool Street Station in East London. My neck of the woods, that area – (if you’re ever going to bump into me then it’s probably in a postcode beginning with E) – and I do like a restaurant with a view. Possibly one of the best views in London, I think – if you’re considering booking the London Eye, don’t bother; go for lunch here instead and ask prettily for a good table. If you ordered carefully and drank only tap water, it’d probably work out cheaper than the Eye anyway. If, however, you decide to drink wine and you don’t order carefully, then be prepared to cry. It ain’t cheap.